In 2003 our kids said it was time to spend time together, to get out of the city to relax and have fun. The entire family agreed and so, on a very long weekend, we looked at every location on the Washington Coast. We planned to buy a home and found some great houses but not in the spots we wanted. We found some great locations but not with the cottage like atmosphere we sought. Then toward the end of the day of searching we stumbled into a little known, small gated community tucked into the trees, just North of where the lazy Copalis River meanders out to the mighty Pacific Ocean. Many beaches on the Coast allow visitors to drive their cars along the sand. It really is a great way of people to discover long stretches of pristine beaches. But the Copalis Rock area had something special. We learned that from April through Labor day, vehicles area prohibited on the the beach from the Copalis River to Iron Springs. (even though light planes are allowed to land on the Beach - the only beach landing spot in the entire state.) Without cars the beach remains quiet and pristine. The home we built - a cottage really - is just up a lazy lane from the beach, an easy stroll any time of the year. Being in the trees we are somewhat protected from the winds which can kick up especially in winter. Maybe you are one of those folks who love to watch the storms - we do. The cottage we built is the perfect spot for your family to visit. You won’t hear cars from the road, but you will hear the waves from the Ocean. In time, you too can rest and relax just as we do. It would be our pleasure to have you visit our getaway and be our guest. 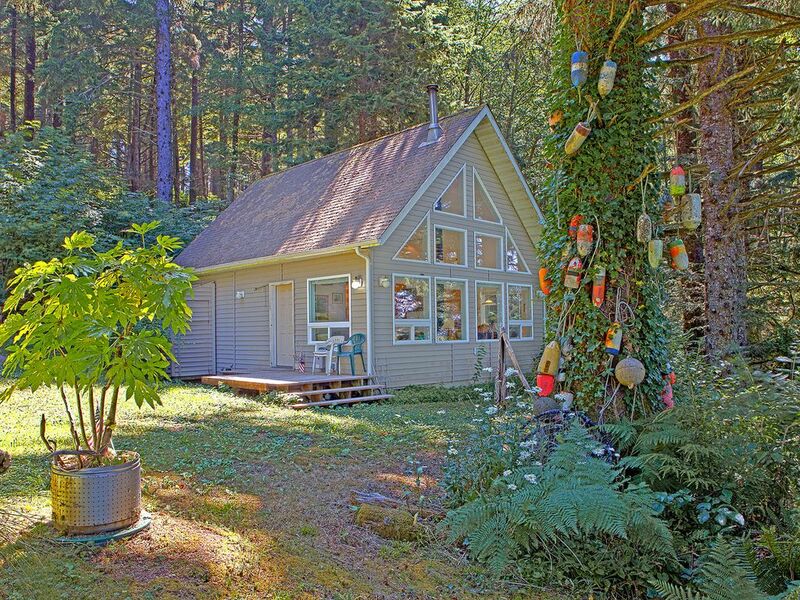 This is a wonderful cottage/cabin. Penny, the property manager is super responsive. It is ideal for a couple's getaway. The driveway to the house and the road to the beach are steep walking with loose gravel and mud. If you are not fully able-bodied, this may be an issue. Copalis beach is really something special. We found whole sand dollars after high tide and had the beach practically to ourselves. At night there were more stars than I ever remember seeing! This is one of the best examples of why the Pacific Northwest is like no other place in the world. The house is at a quiet , beautiful location. It has all the basic appliances to make your stay comfortable. The upstairs loft has 4 bunk beds but no doors or closet. It was a 10 mins walk to a beautiful beach with not too many people. Ideal for a quiet getaway with a small family. The house overall is not very big. The house and location are amazing. There's a short walk downhill to a wide, secluded beach. There was plenty room for our party of six. We were able to enjoy home-cooked meals each night. Thankfully the house is at the top of the hill. The steep road was a little more than I am used to. If I get summer visitors again next year, then Penny's place will be the first on the list. We arrived at the property at 5:30 pm and when we opened the door, the musty moldy smell was overwhelming. We opened windows, turned on fans and found incense in the house that we burned but the smell remained. The windows we opened were all dirty and we had to wipe cobwebs from around the TV screen and many other places around the house. The yard was poorly maintained. We did enjoy the beach which was a walk down a pretty good hill but was private and quiet once you got there. Probably would not choose this property again. Instructions and contract was very difficult to understand as well. We enjoyed our stay at Sandy's Cottage. It was clean, the master bedroom bed was comfortable and it was a short walk to the beach, without crossing any streets, which is perfect for dogs. It was quiet. No one else on the beach and nice sand. We will return to stay there again.